Thanks for all buyer’s reviews, We have improved the Sunglasses, It will be not breaks easily! All ATTCL customers enjoy 30 Day Money Back Guarantee, If you have any problems in the future, Please contact us, We will provide you the best service! [Lens ] 100% UV protection and Polarized lens. [Service]: 30 DAY MONEY BACK GUARANTEE – All ATTCL customers enjoy 30 Day Money Back Guarantee. Customers can return and get refunded in case the purchasing is not satisfactory for any reason. You have no risk to try and we will provide you the best service! ATTCL provide the most high quality and fashionable,The coolest sunglasses. Please pay attention more ATTCL Brand, You will find more surprises!Polarized Shatterproof Polycarbonate lens.Maximum UV 400 protection. Blocks 100% harmful UVA & UVB rays. The cat eye women sunglasses lens height is 2.2 inches, width 1.8 inches. The arm length is 5.4 inches, bridge width 0.6 inches.This cat eye sunglasses Suitable for a variety of face type , easy to match a variety of clothing. The fashion sunglasses color is both stylish and fashionable that able to meet your different colors of the preferences and pursuit. This women sunglasses arms with metal material that is durable for use.The frame with plastic materials and the lens with resin material that is lightweight and comfortable. 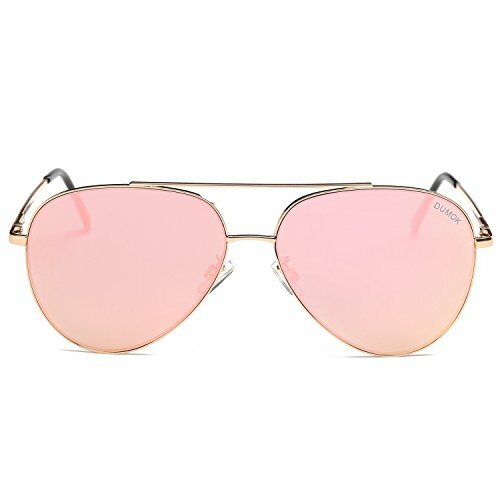 CCKIISE sunglasses mirrored can give the eyes more comfortable, easy to travel and playing.The sunglasses with a popular and quality, is a good choice for you.The women sunglasses with a fashionable style that enhance people’s temperament. The overall product of the glasses looks refined, reflect the women’s elegant and gentle. This fashion cat eye sunglasses has a variety of colors that can be offered to you. The color is both stylish and fashionable that able to meet your different colors of the preferences and pursuit. This cat eye polarized sunglasses arms with metal material that is durable for use.The frame with plastic materials and the lens with resin material that is lightweight and comfortable. The polarized sunglasses mirrored lens can blocks strong light and ultraviolet light, making the eyes more comfortable, easy to travel and outdoor sports. The ladies sunglasses lens height is 2.2 inches, width 1.8 inches. The arm length is 5.4 inches, bridge width 0.6 inches.CCKIISE sunglasses Suitable for a variety of face type,use cat eye design,easy to match a variety of clothing. UV400 PROTECTION -100% UV400 Protection Lens,blocks 100% Harmful UVA,UVB & UVC Rays. There are too many light sources in life that produce harmful rays, especially sunlight. UV400 rated sunglasses is essential to protecting your eyes against long term UV damage and keeping your eyes healthy when you go out. HIGH QUALITY MATERIALS – Dumok sunglasses are made of high quality material that is durable enough for long time using. We use silicone nose pads design, reduce nasal pressure, allowing you to wear comfortable. FASHION STYLE – Round cat eye sunglasses have been an iconic piece in the fashion world for years. Today, round shades are recognized as one of the most popular and trendy sunglasses out there. WHY CHOOSE AOBOO POLARIZED SUNGLASSES? WE provide 180 DAYS WARRANTY period and 30 DAYS MONEY BACK GUARANTEE – Aoboo Glasses Factory provide all customers 30 Day Money Back Guarantee and 180 days warranty prieod. We promise if you are not happy with Aoboo glasses within the first 30 days, we will refund you without any reason and take care of the returning shipping fee. You have no risk to try and we will provide you the best service! So WHY NOT have a try for free! HIGH QUALITY :All Aoboo sunglasses are made of the highest quality materials to ensure that durability and avoid breakage . SIZE: Lens Height:55MM(2.16Inches), Lens Width:51MM(2Inches), Total Width:143MM(5.62Inches), Nose Bridge:16MM(0.62Inches), Frame Length:130MM(5.11 Inches). Aoboo Metal Polarized Cat Eye Style Sunglasses – 100% UV400 protection coating, blocks 100% harmful UVA & UVB Rays. Polarized sunglasses reduce glare reflected off of roads, bodies of water, snow, and other horizontal surfaces. Restore true color, eliminate reflected light and scattered light and protect eyes perfectly. 1. Taking off with one-hand will damage the balance of the frame left and right, resulting in deformation, and suggest that you take the mirror leg with your hands and pick it in parallel direction along both sides of the cheek. 2. Generally, the left mirror leg will be folded first when wearing, which will not cause the frame deformation. 3, advice, water glasses with a paper towel blot moisture, using special glasses cloth to wipe again, must hold to wipe the mirror side of the picture frame edge silk, gently cleansing lenses, avoid excessive force the frame or the lens damage. 1>.Clean the Lens by Water or Wipe Them by the Soft Cleaning Cloth Included Regularly. Do Not Use Alcohol or Any Other Chemicals to Clean the Lens, to Avoid Surface Broken. 2>.Do Not Maintain the Sunglasses in Such Bad Environment of High Temperature or Long Time Damp, to Avoid Deformation. 1.30 Day Money Back Guarantee- You can easy return and get refunded for any reason like I don’t like the style,I don’t like the color,etc. Don’t worry,You have no risk to try. 2.FEISEDY guarantee and great customer service: If you have any problem on product,shipping or return, please contact us.We will help you solve the problem at the first time.Please don’t leave any A-to-Z Guarantee Claims, negative comments or reviews before we help you solve the issue. The New seller needs your support. FEISEDY is the sunglasses brand seller with leisure & fashionable life style, Which plays an important role in caring your vision and protecting your eyes from harmful rays. We are the OEM(Original Equipment Manufacturer)for well-known national brands many years,and focused on high quality glasses. FEISEDY only aim to bring you high quality fashion sunglasses. ULTRA LIGHT FRAME – FEISEDY with ultra-light frame material, so that your face can not feel the weight of the extrusion. UV400 AND HD LEN – FEISEDY Lenses block 99% or 100% of UVB and UVA rays. At the same time, High-definition lens allows you to better observe the scenery in the sun. ADAPT TO ALL OCCASIONS – such as walking, driving, shopping, traveling, taking photos, and is suitable as high fashion accessory and daily wear all year round. It is also gift ready ready, making it a wonderful yet practical gift idea for friends and Family!